Took Meg to the vets on Thursday to be weighed - 13.5kg so she's doing well there. Had a chat with the nurse about the problems we're having and basically she needs more stimulating. We have all the right toys for her but she talked about some games to buy and things to do, hiding toys, treats etc for her to found so started with a chew hidden under a plantpot which she found eventually. Needs longer walks too. Just got back from a walk and was talking to neighbour at the front when she tried biting her clothes, she soon stopped her, fortunately she has dogs so understands but still felt bad about it. Once back in the house she went mad, running around and jumping and pulling at my cardigan, pushed her out onto the stirs and just cried to Malcolm that she was driving me mad. After a few quiet moments, allowed her back in and she's been as good as gold since. Hope the weather's fine tomorrow as I can see a lot of walks and being outside. Awww Cath. It's so hard isn't it? Have you crated her? It really will save your sanity when you need time out. Take a look at the remote citronella collars too. Have tried the crate again and trying to fed her in there too although she's not keen and barks a lot but will continue and see how she goes. Enjoyed a great walk at the park this afternoon and really tired her out as we used the training lead whilst playing with the ball which she really enjoyed. Behaved when she met lots of other dogs too. 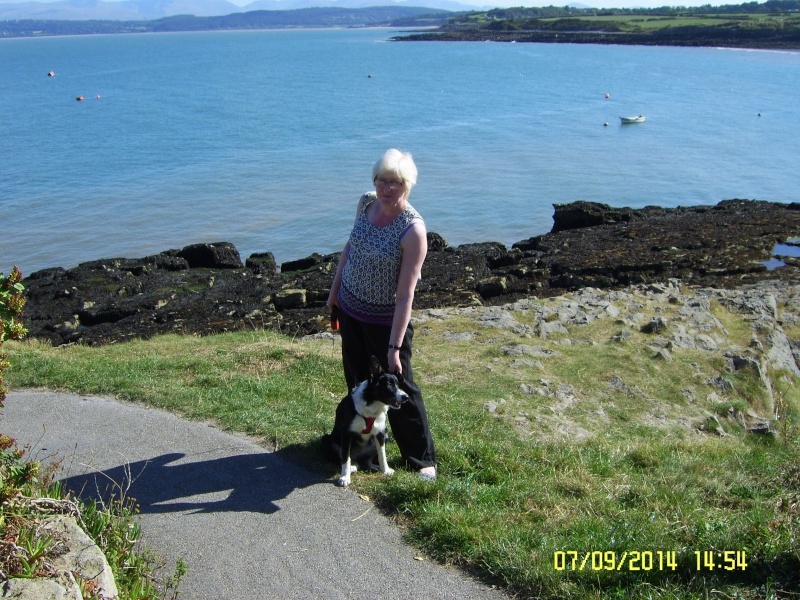 Glad you have a tired out puppy Cath, hope you makd steady progres with her like Lorraine is with Saxon. That's good. Plod on hun, you'll get there. Find it is a great game Cath. If she knows sit and stay, leave her and hide a few tiny treats all around the rooms she can go in. Maya loves it and takes her ages to find them as I always choose new places, does tire them out too. Collies never forget anything and negative things like citronella collars would probably ruin her. i made that mistake with some things like rattle bottles and discs, I am sure that's why she is so bad with noises now. Or try make your own with a rope and a bottle, just a thought. Probably would work with a few treats in. Well Meg was really good when we were away last week, loved having the run of the garden and only did a bit of digging. Had her first taste of going in the sea but ended up with some white fur going pinky purple as the dye from her collar ran, she did look funny and still a tinge there now. 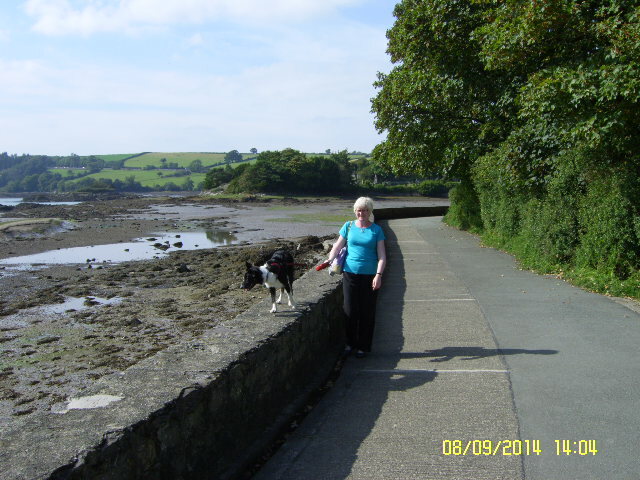 Lots of walks down the lane to the beach which was ok for walking but not one for siting on. 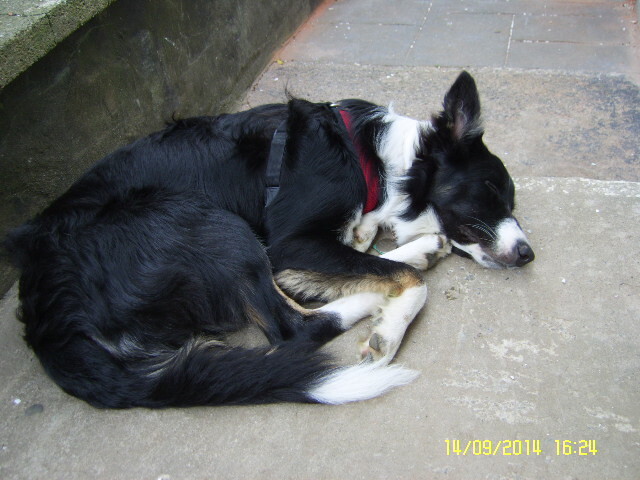 Met lots of dogs on our travels around and she would just lie as if ready to round them up so some of my walks did take longer than others, and then became quite submissive when people came over to her, loved all the attention. Now we're back home she's back to her usual self, tried letting her in the garden on her own but has dug a big hole under a bush again and chewed some flowers so it's back to the long lead unless we go out with he. Think she'll miss me when I go back to work next week as she's followed me round for the past two weeks and has even been allowing a few cuddles but only when she wants them. She loves to walk on the walls. Looks as she enjoyed her time away lol. It sounds as if she likes to be kept busy. Yep looks like she had a great holiday, you too. Smashing Cath. Glad it was good. 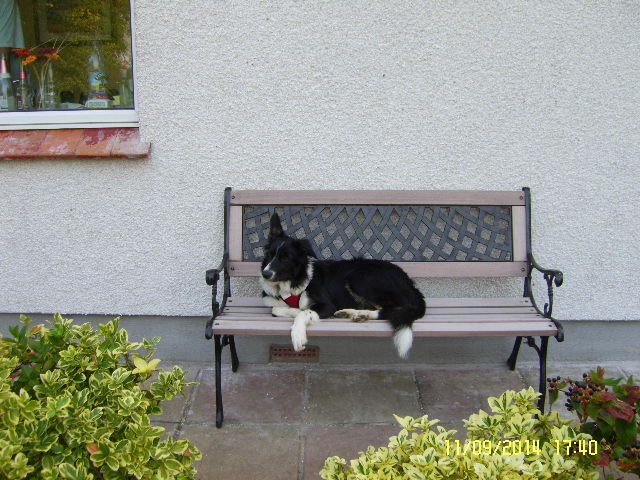 Comfy on the bench, lol. Great pics, the first one has to be scrapped, it's so lovely. Puppy Foundation classes stated last night and although it was mostly talking Meg did quite well as we started to use clickers. She befriended a lovely German Shepherd who was 17 weeks old Lorraine and I think they'll be the naughty ones as the others were sitting quite still they wanted to mooch about. They did get some Kongs and bones out for them though. She sounds like Maya, fantastic on holiday and pain but as in nervous way at home.